70 JIFFY Ways to Prepare Delicious Desserts from Everything—Rice, Wheat, Paneer, Khoya, Yoghurt, and Hold Your Breath, Lentils and Veggies! 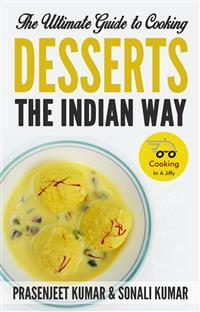 As Only Indians Can.From the author of # 1 Best seller “Cooking In A Jiffy” series of cookbooks, comes a mind-boggling tribute to sweets, puddings and desserts, the way Indians cook them in their homes even today.There are eight great Indian desserts that use rice, twelve outstanding ways to turn wheat in to delicious puddings, six protein-filled desserts that use lentils, seven puddings Indians love to make from veggies, a dozen outstanding classics that use Paneer, eleven dessert recipes that are made from Khoya, and six recipes that use yoghurt. There are also seven recipes that are inspired by the British Raj and are still served in many Indian clubs and messes of the Armed Forces. Most recipes are low-calorie, don’t use eggs, and permit the use of sugar-substitutes. They also can be made in a JIFFY, without special equipment or moulds, without pre-heating ovens, without waiting for hours for your stuff to bake, and so on. All rights reserved. No part of this book may be reproduced, stored in a retrieval system, or transmitted, in any form or by any means, electronic, mechanical, photocopying, recording or otherwise, without the prior permission of the copyright owner/s, except in the case of brief quotations embodied in critical articles or reviews. Photographs of dishes have been provided wherever possible. All photographs are taken by the authors, in natural light, without using any inedible garnish or props, and of the dishes that were made right in their home. These are just meant to illustrate how exactly the dish would look like if you prepared them yourself. Edited by: Arun Kumar Ph.D.
As a way of saying thanks for your purchase, we are offering FREE (worth $2.99 on all major e-book retailers) our Amazon #1 best-seller “How To Create A Complete Meal In A Jiffy”. Presenting a Cookbook like No Other Cookbook in the World. From the popular website www.cookinginajiffy.com and the author of a number of Amazon Bestseller cookbooks comes a cookbook that doesn’t focus on recipes. Although the Authors have made every effort to ensure that the information in this book was correct at the time of publication, the Authors do not assume and hereby disclaim any liability to any party for any loss, damage, or disruption caused by errors or omissions, whether such errors or omissions result from negligence, accident, or any other cause. This book also assumes that the reader does not suffer from any food allergies or related medical conditions. Readers suffering from food allergies are requested to skip the recipes that contains ingredients which trigger adverse reactions in that reader or in his/her family and friends. The spellings used in this book are British, which may look strange to our American friends, but NOT to those living in Australia, Canada, India, Ireland and, of course, the United Kingdom. This means that color is written as colour and so on. We hope that is NOT too confusing! Chapter 1: Desserts – Why Bother? That’s what dessert means to me: a dollop of sweet love in an otherwise cold world. Great question. So let’s start with a little history. There is no doubt that humankind from time immemorial has loved the sweet taste as it occurred naturally on Mother Earth. If anything, our instincts taught us to eschew anything that tasted bitter and trust everything that tasted sweet. As we learnt to grill, bake and finally cook on pots and pans, some experimentation in mixing sweet stuff like honey or fruit juice with other food products would have naturally started. But preparing a dessert, as we know it today, had to wait till sugar could be extracted from sugarcane in India. Or from beetroot in Europe. So it was natural that Greek and Roman Symposia in 300 BC, as the classics describe, used to conclude with fresh or dried fruit and nuts ONLY. Even in 1430, when Joan of Arc was captured by the Burgundians, she is said to have just some fruit after dinner. In Victorian England, the final course was often a “savoury,” such as grilled sardines! But the Crachit family in Charles Dickens's A Christmas Carole, set in the late 1830s, is described as all excited about having "the Pudding" after dinner. So it looks like sugar had reached England by that time. Etymologically, the word "dessert" comes from the Old French word "desservir," which meant strangely "cleaning the table." The word gained popularity in the 17th century Europe where entertaining used to be an all-evening/all-night affair. The lavish spread laid out on long dining tables used to be taken as the measure of one’s social standing. And if there was one extreme stigma attached to this activity, it was to let food run short or to let anyone leave hungry. All these innovations made it possible to let the cooks and servers get home quicker. But more importantly, these helped the host look good for serving everyone to the point of complete satiation. So what desserts did was to fill guests up to the brim and helped "desservir," or "clean the table." As the nobility also discovered, sugar, and anything sweet in general, was an appetite depressant. This meant that no one who had a dessert after a lavish meal could ever complain of being hungry. There is also a theory that way back, before refrigeration was discovered, meats had to be heavily spiced to mask their deterioration that could border on rancidity. The sweets following the main course helped cover any such taste of the main course rather well. Susan Pinkard in her book A Revolution in Taste: The Rise of French Cuisine explains how the tables of nobles contained dishes of many flavours (savoury, bitter, salt and sweet)—often with conflicting spices— as some kind of “show” of wealth. There were many gradual developments in the art and science of food preparation that included the separation of flavours, complimentary textures and a “sweet” at the very end of the meal “like the epilogue of a great book.” These were often accompanied by a bitter, strong cup of coffee or tea or even cheese. Sugar, especially cane sugar, imported as it was from distant India was an extreme luxury. Only the very rich could afford it. And so they served dessert in small amounts at the end of the meal. Having an expensive sweetened dish served at the end of the meal thus ensured it would be remembered the most. Now for, aah, the eternal question. Why should anyone in today’s age and time in his right senses indulge in any calorie dense sweets, sweetmeats, desserts, mithais or anything that such sugary or syrupy dishes are known by anywhere in the world? The question arises because, as the health freaks around you will tell you, all these desserts rather unnecessarily overload your system with “empty calories” and cause a sugar spike in your blood that is best avoided. But what if you are a connoisseur of desserts, who doesn’t need an occasion to celebrate? Or, if you like to “feed your soul with food that makes you feel as if heaven has descended on earth”? Oh, yes now you very well can. Apparently some latest research indicates that all such sweet stuff may (in moderation, of course) be good for your health. They in fact have some really positive effects on your health, heart, mind, and sleep. Lovers of dark chocolate will love this little piece of research. In a study from Neurology, 37,000 Swedish men aged 45 to 79 recorded their diet over the course of 10 years. During that time, 5% experienced their first stroke. After multivariable adjustments, those who ate the most chocolate (62.9 grams per week in this case) were found to be 17 percent less likely to suffer from a stroke than those who never had chocolates. So the lesson is to check ingredient lists and either stick with cocoa powder or selectively choose your dark chocolate. Don’t you now have an excuse to eat the best-quality dark chocolate every day without feeling guilty about it? That’s if you wish to stay fit! Believe it or not, but in a study, published in Steroids, researchers at Tel Aviv University’s Wolfson Medical Centre have claimed that eating cookies and cake in the morning could actually help non-diabetic obese people lose weight. The study looked at about 200 obese adults who were put on low—calorie diets. One group ate a large 600-calorie breakfast followed by a slice of cake or doughnut or cookie, while the other was put on a 300-calorie protein-packed diet of egg whites, tuna, cheese and milk, minus any sweets. Four months later, both groups lost about 30 pounds (about 15 kgs) per person. But, in the subsequent four months (the study’s maintenance period), the high-protein group regained around 22 pounds, while the sweet-loving group continued to shed weight. Dumbfounded, researchers attributed these results to the reduced cravings, which may have made the subjects feel less hungry throughout the day. Experts, however, advise that such studies shouldn’t be taken as a license to add too much of refined sugars to your breakfast. Instead, we should try to find more natural ways to sweeten your breakfast by adding, for example, honey, agave or fruits. Yes, the same flavonoids in dark chocolate that lower the risk of stroke, help also reduce blood pressure. Twenty different studies reviewed by the Cochrane Collaboration established that people who ate between 3 and 100 grams of dark chocolate or cocoa powder each day lowered their blood pressure by around 2 to 3 mg Hg. Research from the Smell and Taste Treatment Research Center, Chicago indicates that the zinc-packed seeds of pumpkin pie increase testosterone levels. Plus its aroma is supposed to reduce anxiety and overall cast an aphrodisiacal effect on you. Now even if you don’t particularly find the pumpkin’s aroma to be a turn-on, there’s no denying that this humble squash comes packed with vitamin A, iron, calcium and fibre. In an interesting study, participants from the University of Minnesota's Joseph P. Redden and Texas A&M's Kelly L. Haw were asked to choose a snack, or dessert, and count how many times they chewed while eating. Most participants felt more satisfied when they counted their bites than when they munched mindlessly. Another conclusion was: there is no harm if you have an occasional piece of sweet but just savour it over a long period by chewing it well! Who hasn’t turned to a pie or an ice-cream or a box of cookies on a “bad day” to help uplift your mood? The reason is that when you eat your favourite dessert, you are flooded with the mood-elevating hormone called Serotonin. That’s what makes you feel like there’s still hope left in the world! And this feeling could be vital to your well-being. Experts advise that constantly denying ourselves some simple pleasures (like desserts) can make us feel like we do not deserve them and can also make us resentful as human beings. So for people for whom dessert is akin to true love, it is okay to go ahead and derive pleasure from a simple activity like eating your favourite sweets. Even Dennis the Menace would agree. When you taste an outstanding dessert, what do you wish to do immediately? Of course, share it with someone you love or care for. That way you also spread a little love around—in your family or friend circle—and reduce your calories when you’re on a diet. That’s what we would call as a win-win situation. And while theoretically you could share any good dish with people you love, desserts somehow lend themselves more easily to such sharing. In India every happy occasion—be it a promotion, a birthday, an engagement or a wedding announcement—is celebrated with sweets. Why? Because eating any dessert spreads cheer all around and makes your day better. You start liking people more and feel like everything is going to be alright. So how should you have your sweetmeats? Now that we have agreed that eating dessert not only makes you healthy, but also makes you a happier and better human being, the question arises as to how we should enjoy our desserts. 1. Have your sweets in the mornings or with your breakfast as you have the whole day to use up the extra calories that are pumped in your blood stream. Some people also like to indulge their sweet tooth around 4 p.m., which is after 3-4 hours of their lunch, as it makes them perkier by giving them a serotonin boost. From this logic, having a dessert after dinner could be quite a BAD idea. 2. You don't have to be miserable to be thin and healthy. What is important is being knowledgeable about what you are eating. So if you have a choice, choose dark chocolate or nut-based desserts over the ones that only have white flour and cream. Similarly, choosing veggie based desserts like pumpkin pie or carrot halva would always be wiser. Ditto for yoghurt based desserts as they are supposed to be swimming with probiotics.